Allinson was a pacifist during the First World War, and was selected as a government war artist by the War Artists Advisory Committee during World War II. Spring in the Abruzzi depicts the beautiful Italian countryside, full of life and prosperity. 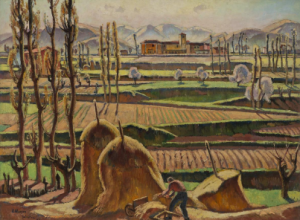 Many artists and writers during the war, facing the constant bombardment of technology, urbanization, and destruction, romanticized the countryside. In the beginning of Rupert Brooke’s poem shown here, The Soldier, he too is connecting with the English countryside to help him brave the horrors of war. 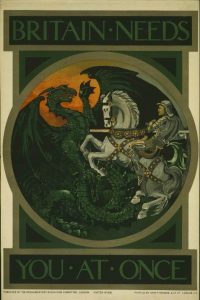 Propaganda in wartime was rampant; the image below is just one example of a poster that would have been used to persuade young men to enlist, as was the song, “Keep the Home-Fires Burning,” a song rooted in the honor and duty associated with fighting for one’s country.